On his weekly radio show, Rabbi Daniel Lapin tackles a wide variety of topics that provoke huge audience reaction. But the response to his show on the three reasons why cursing damages people on both a very practical as well as a deep spiritual level, triggered an unprecedented reaction. This unique blend of Bible lessons and no-nonsense teaching explains how vulgar language hurts in the here and now, diminishing opportunities for economic and romantic triumph while also injuring a person's innermost soul. If you ever find yourself appalled by the language of a movie or TV show, if you or your children, nieces and nephews casually use words that would have earned a mouth full of soap a generation ago, if you want to understand the potent power of speech, this CD is for you. It will arm you with effective arguments and tools with which to battle the overwhelming presence of vulgarity in today's society. Hands Off! This May Be Love, presents to people from all religious backgrounds the revolutionary idea of refraining from all physical contact before marriage. Highly readable, the book presents scientific and social proof about the power of physical touch and how the widespread practice of prematurely introducing touch into a relationship can sabotage true and lasting love. This book provides young (and not-so-young) individuals with surprising and thought-provoking ideas and also offers encouragement for doing what is both right and effective rather than what is popular. Intriguing, inspiring, poignant and personal. We all have questions about how best to manage the important parts of our life. 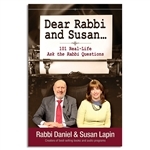 We have picked 101 of the most asked and commented on Ask the Rabbi questions and put them in one jam-packed book, composed of four sections. You might agree with our answers, you might not. But you will identify with the questions and we hope the answers make you think and open up hours of enjoyable and substantive discussion with your family and friends. 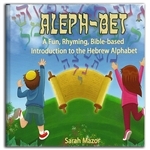 Children will love the colorful pictures and adorable rhymes in Aleph-Bet: A Fun, Rhyming, Bible-based Introduction to the Hebrew Alphabet. Each letter of the Hebrew alphabet is introduced along with a child whose name begins with that letter as well as a word starting with the letter. The featured word appears in both Hebrew and English along with a translation, transliteration and matching picture. A unique feature of the book is the Biblical index at the back. While all the words chosen by the Jerusalem born author are used in modern Israel, their origins are found in Scripture. In some cases, the word is exactly the same, such as 'aryeh' or lion, while other words are derived from Biblical words. For example, the word for train, 'rakevet' has its root in the Hebrew word for riding. The index shows the word and one of the written verses in the Bible where that word appears. In addition, some historical and fun facts about Hebrew are given. This makes the book interesting not only for the recommended ages of 2-6 but it also will intrigue older children allowing them to make the connection between Bible studies and the Hebrew language. * Can social networking replace face to face meetings? Become happier, healthier and wealthier. Get on track with the spiritual strategies that God built into the world. Rabbi Daniel Lapin shares ancient Jewish wisdom's insights that will empower and guide you to an enhanced life. A companion piece to Thou Shall Prosper (book) and Boost Your Income (CD). After listening to this ground-breaking Torah teaching audio CD from Rabbi Daniel Lapin, you will be prepared to explain to both friends and foes why the Ten Commandments should not only be proudly displayed but why our society will suffer if they are not. Whether or not you know Hebrew, whatever your background, you will easily follow a thought provoking and entertaining analysis. For instance, Rabbi Daniel Lapin asks a very basic question, "Why couldn't God have written smaller and fit everything on one tablet?" You will be astonished and enlightened when you discover how every successful human relationship hinges on understanding these verses. The 10 Commandments will never again be the same for you. This powerful presentation will inspire and entertain you as Rabbi Daniel Lapin reveals how all our most satisfying and creative interactions flow from these vital verses. America's families, communities, culture and future destiny all derive from the ancient secrets that pour out of 172 mysterious and monumental Hebrew words. No matter whether you have studied this chapter of the Bible repeatedly or if you aren't even sure what directives make up the Ten Commandments, you will be astounded by this eye-opening teaching. Making ancient Jewish wisdom passed down from Mt. Sinai accessible, Rabbi Daniel Lapin will introduce you to the Ten Commandments in an authentically traditional but breathtakingly modern way. * Should the Ten Commandments be displayed in public? * Are they more important than other parts of the Bible? * Why must they be on two tablets? * What do they really mean? It's safe to say that nearly everyone is seeking a happier, more successful life. So then why do so few attain it? Business Secrets from the Bible proposes a new way to view and approach success—one based upon key concepts from the Bible that are actually surprisingly simple. Written especially for those seeking success in the realms of money, relationships, and spirituality, this book encourages readers to realize their common mistakes, come to terms with them, and turn those mistakes into future triumphs. Filled with concrete advice for improved finances, spirituality, and connection, this resource takes a practical approach and aims to change not just the minds, but the actions of readers with a self-evident and persuasive pathway. Drawing on his wisdom and knowledge of the Bible, the author reveals the clear link between making money and spirituality, and urges readers to focus on self-discipline, integrity, and character strength in order to achieve personal prosperity. Special emphasis is given to establishing positive attitudes toward making money and adopting effective Biblically-based strategies. Attaining wealth and well-being is no longer a mystery. Let this book identify and correct the errors that are keeping you from fulfillment and happiness. * Did Moses Really Say, "Let My People Go"? Are life's burdens sapping your freedom and vitality? Are money worries, illness, loneliness, addiction and other circumstances, both in and out of your control, making getting through each day an overwhelming challenge? In this practical and inspiring presentation, Rabbi Daniel Lapin decodes three lessons from the Exodus story that will inspire and guide you to escape your troubles and build a better life. He reveals how the Exodus event, far from being only a historical tale, is actually a usable blueprint for redemption. The very actions taken by the Israelites on their escape from Egypt can be applied by individuals to jump start their own liberation from many of life's harsher realities. By explaining the deeper meaning of key biblical phrases and by accessing 3,000 years of Jewish wisdom, Rabbi Daniel Lapin helps you benefit from this section of the Bible in a way that has not previously been available to the general public. This compelling presentation has been enthusiastically received in synagogues and churches around the country, and now it's your turn to share in the excitement. 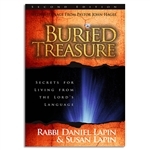 Buried Treasure: Secrets for Living from the Lord's Language gives you a glimpse into God's understanding of love, happiness, faith and wealth. This second edition is expanded and includes an entirely new chapter. Join Rabbi Daniel and Susan Lapin on a fascinating treasure hunt through the Lord's language - one which will excite and inform those with no knowledge of Hebrew as well as those who are fluent in the language. Unlike any other language ever spoken, Hebrew words reveal their meanings through the very order, composition and even shape of the letters that God chose for each word. Among other nuggets of insight, discover why in Hebrew the word "face" only appears in the plural, why a table is a place of grace, and why it is more important to have a spouse who is committed to you than one who professes love for you. 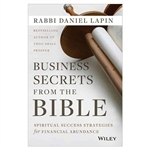 Using real-life anecdotes drawn from his many years in the rabbinate, as well as from the hundreds of thousands of people he has touched while teaching throughout America and overseas, Rabbi Daniel Lapin uncovers a wealth of insights that will enrich your life. Buried Treasure is an easy-to-read, practical book that will entertain and instruct you while revealing the awesome power of God's chosen tongue. * Are you handicapped by yesterday's mistakes? * What is the truth behind astrology and horoscopes? * Why does the Bible mention the Day of Atonement three separate times? * Do you know Jonah's lesson for your life? All human beings say and do wrong or embarrassing things. After a while, the burden of continually disappointing ourselves relentlessly bears down on us. Our self-image withers and it can even seem that invisible forces are sabotaging our success. Without peace of mind and soul, every area of our life suffers. Using lessons from the Jewish Day of Atonement - Yom Kippur - Rabbi Daniel Lapin provides a guide to facing the mountains of mistakes we all make. Before moving forward, we must acknowledge and accept the past. You will be amazed as he explains why a day of self examination is especially helpful during the astrological sign of Libra. In order to quick start the atonement process, Rabbi Lapin illustrates how to weigh the balance we are keeping in three specific areas of our lives: coping with the gulf between our ideals and the reality of being imperfect human beings; managing personal versus communal needs; and evaluating the needs of our bodies versus the needs of our souls. Through this program, you will be led to the joy of an upbeat future freed from the guilt and baggage of the past. So many of you have told us how much you love the book Thought Tools 2008! 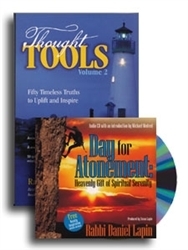 Now you can get all 50 timeless Thought Tools from 2009, in this attractive and convenient book. Read them to yourself or share them at the dinner table. Either way, you'll love these fifty insights which reveal secrets of ancient Jewish wisdom providing practical advice in the area of family, friendship, finances and faith. Thought Tools expand your thinking and spark meaningful conversation. Thought Tools makes the perfect gift for family and friends. Just imagine, at this incredibly low price, you can provide a year filled with growth and meaning for all your loved ones.